You are here: Home / Ent. / Be Sure to Catch BLACKKKLANSMAN ASAP. Be Sure to Catch BLACKKKLANSMAN ASAP. (ThyBlackMan.com) Ladies and gentlemen, I just saw Blackkklansman, and I urge you to see it too ASAP. It is entertaining, informative, empowering and towards the end you will be sitting on the edge of your seat. It starts off slow and quirky and steadily builds in intensity. Somehow we have it firmly planted in our heads that learning is one thing and being entertained is another thing. Spike Lee shatters that false dichotomy. Blackkklansman is based on a true story. John David Washington, the son of Denzel Washington, stars as the Black detective who calls a chapter of the KKK asking to join that terrorist organization. He sends his white partner to the meetings while remaining the voice on the other end of the line when communicating with the KKK by phone. The white partner is Adam Driver, who played a young Darth Vader in the last Star Wars. 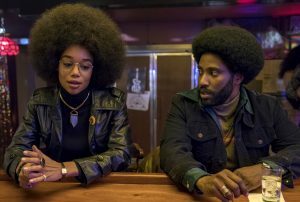 The female lead is a dead ringer for Angela Davis, Laura Harrier. Harry Belafonte has a small but pivotal role. Everything before builds up to his riveting contribution, and everything after flows from it. Spike Lee somehow spins a great tale, yet simultaneously schools the audience, painlessly, on American history, film history, Black history, Black politics, gender relationships, anti-Semitism, and more. Blackkklansman is cast in the mode of Do the Right Thing. It deals heavily with racism and the two contrasting, conflicting Black responses to that scourge, but it goes far beyond that. It speaks directly to every segment of this society and is as relevant to today’s headlines as it is to what we should have been, but never were, told in history class. Do you remember Spike Lee’s BAMBOOZLED? At the end of it, he let’s us peep his hole card. He shows the audience what amounts to his playbook in an extended interlude that systematically exposes, with copious examples, the history of Black movie stereotypes. None of his films after Bamboozled, though they did not shy away from race, had race at the center. InBlackkklansman he comes full circle and back to race, full bore. It is by far the most important movie made this year and in many a year. Once again, he may not win the Oscar, but he certainly deserves it. Other films may, or may not, be more technically proficient than Blackkklansman but none come close to it in relevance or impact. Again, I urge you to see it ASAP. No, the revolution will not be televised. Likewise the television ads forBlackkksman do not even scratch the surface of its content, let alone its import for African America and the entire nation. The power, majesty and grace of this film is made all the more evident after one has been forced to sit through a dozen previews of vapid, brainless movies before seeing this masterpiece.